A powerful portable punch and forming tool has been developed by Melbourne precision metal engineering company John A.L. Mills and Associates using Enerpac high pressure hollow plunger hydraulic cylinder technology. An RCH 202 20-ton push/pull cylinder – part of a hollow plunger range in capacities from 13-95 tons – has been incorporated into the punch and forming tool designed to apply precision force when operated in confined and awkward spaces. 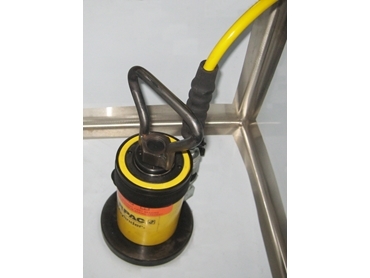 Actuated safely and remotely by an Enerpac F-392FP foot pump – which leaves the operators’ hands free for the job - the tool’s extended plunger is inserted through the drainage hole of the sink to be connected with a die on the other side. The cylinder is then retracted to draw the punch die through the stainless steel to enlarge the existing 90 mm drainage hole to 125 mm, so as to accommodate the dry basket. The punch/form tool is then inverted for connection with its forming die, which is actuated to form a recess contoured to accept the new basket’s drainage flange. The contoured flange ensures a watertight fit and keeps the drain flush with the bottom of the sink. The punching and forming process is undertaken in two parts to give the best finish, says John A.L. Mills and Associates Managing Director Mr John Mills.